Top Jr. Middleweight contender Erislandy Lara scored a dominant twelve round unanimous decision over longtime contender Delvin Rodriguez on Friday night at the UIC Pavilion in Chicago, Illinois. Lara was in command from the opening bell in a bout that at times resembled a sparring session. Lara’s ability to use angles, be elusive and pick his spots with precision timing was the story of this fight. Lara was able to frequently snap the head of Rodriguez back throughout this fight with crisp and accurate combination punching. The highlight of the fight came in the closing seconds of round six when Lara dropped Rodriguez with a left hand. Although the always “Game” Rodriguez was able to get up from the knockdown and ultimately did go the distance in this fight, he was simply unable to solve the puzzle of Erislandy Lara and was outclassed. At the end of the twelve round bout, all three official judges Bill Lerch, Steve Weisfeld, and Robert Hoyle scored the fight identically 120-107, a shutout in favor of Erislandy Lara. Erislandy Lara advances to 21-2-2, with 12 Knockouts. Delvin Rodriguez falls to 28-8-4, with 16 Knockouts. Unofficially, I scored this fight the same as the official judges 120-107 in favor of Lara. 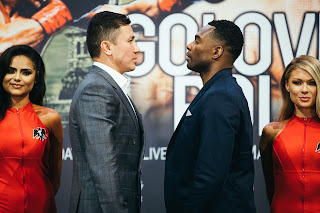 For Lara, who holds interim/regular champion status in the World Boxing Association’s (WBA) Jr. Middleweight ratings, this victory will likely keep him in line for a title shot. It will be interesting however, to see where Lara will fit into the equation as Floyd Mayweather recently announced his intention to relinquish all world titles he currently holds in both the Welterweight and Jr. Middleweight divisions. This would appear to open an opportunity for Lara to fight for a vacant world title seeing as Mayweather holds both the WBC and WBA world championships in the Jr. Middleweight division. It is also certainly possible if Mayweather, who also holds the WBC, WBA, and WBO world championships in the Welterweight division, does indeed relinquish his championships in both divisions that Lara could be named WBA champion per his holding interim/regular status in the WBA Jr. Middleweight ratings. Following his victory over Delvin Rodriguez Lara expressed his interest in seeking fights against Mayweather or moving up six pounds from the 154lb. Jr. Middleweight division to the 160lb. Middleweight division to seek fights against either WBC world champion Miguel Cotto or undefeated unified WBA/IBO world champion Gennady Golovkin. Although Lara dominated his fight against Delvin Rodriguez, a possible criticism of some might be that Lara did not take advantage of some opportunities throughout the fight when it appeared that Rodriguez could have been on the verge of succumbing to accumulated punishment and did not close the show. Even though the crowd in attendance periodically expressed dissatisfaction during the course of this fight by booing due to lack of action, for Boxing purists Lara put on a masterpiece and even though he did not go for the knockout, it was as close to a perfect performance as one could get from a pure Boxing standpoint. A conundrum however, that Lara might face as he seeks more lucrative opportunities potentially against the likes of Mayweather, Cotto, or Golovkin is that those fighters might view an encounter with him as a high risk/low reward scenario. Lara is after all highly skilled, very elusive, and has a style that has proven difficult for opponents to solve. Lara however, has only been defeated twice as a professional by Paul Williams and Saul Alvarez. An argument can be made that Lara could easily be an undefeated fighter. He did after all give Saul Alvarez all he could handle in their fight in July of last year and some feel he deserved the decision in what was a very close fight. Many observers, this one included, also feel that Lara was the victim of injustice in a fight where the three judges who scored the fight in favor of Williams via majority decision were indefinitely suspended by the New Jersey State Athletic Board Of Control following the fight. Despite those setbacks, Lara has remained a key player in the Jr. Middleweight division. Although Lara may not always be a crowd pleasing fighter to watch, there is no denying his skill level. Regardless of where Lara will choose to fight whether he continues to campaign as a Jr. Middleweight or decide to move up to the Middleweight division, he should get an opportunity to face the best fighters in either division. There is no doubt that fighters like Floyd Mayweather, Miguel Cotto, and Gennady Golovkin are stars of the sport and in the case of Mayweather and Cotto are first ballot future Hall of Famer’s. All great fighters however, have to from time to time take risks. Whether Mayweather, Cotto, Golovkin, or another star in the sport decides to take what may be considered a high risk/low reward scenario by facing Erislandy Lara, it is clear he has earned the opportunity to show when he can do against the best of the best. Whether he gets that opportunity remains to be seen.